Item shown above : CHERRY Finish. (Pocket Watches are for display only, NOT INCLUDED). A great way to display your pocket watch collection. 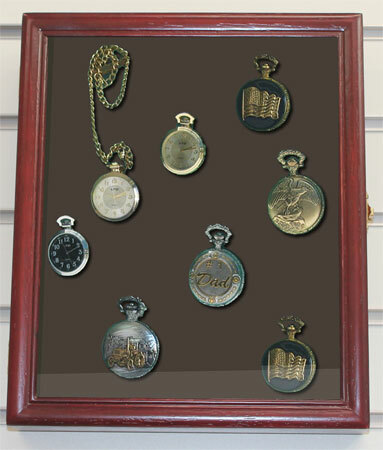 This pocket watch display case is Green or Black matted to create a lovely contrast. Soft foam in the backing to protect the watches. Brass hinges, door latches, and wall brackets to hang (wall mounted). Glass door cover to protect from dust and damage. No assembly required.